Ryemilan's Ramblings: Hope you've had a trunkload of fun! Long time no blog. Sorry for just kinda falling off the radar there....but summer holidays will do that to you sometimes. I hope that you all had a lovely peaceful Christmas and New Year, and are looking forward to a fun and smile-filled 2010 (that still seems like a really weird number to me....2010....makes me think of George Jetson and space ships for some reason...Hhhhmmmmmmm)! Anyhoo, here I am with a small blog offering. I made this card some weeks agao, but didn't have everything I needed to finish it at the time, so I put it aside, and kinda forgot about it (as I said before, summer holidays will do that to you ;-). Accessories: White Gel Pen, Sponge, Baja Breeze Striped Grosgrain Ribbon, Crimper, Chocolate Chip 5/16" Brads, 1 3/4" Circle Punch, Stipple Brush, SNAIL adhesive, Sticky Strip and Dimensionals. Its been such a long time since I picked up any of my craft stuff that I had to go get the catalogue so I could work out what everything I used was called! You probably can't see from the photo, but the Tangerine Tango background layer has been inked along the edges (with a sponge), in Tangerine Tango....probably why you can't see it, eh? Gee I'm quick today :-). 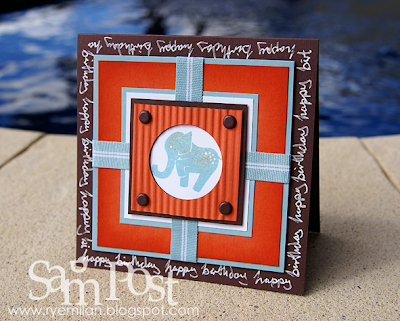 Also, I've stippled the Baja Breeze elephant with Tangerine Tango on his back. Doubt there are many elephants coloured thus in the real world...but there are in my head ;-). Hope your lovely and refreshed from that beautiful holiday! LURVE this wonderful card - the handwritten happy birthday border is sensational! WooHoo Sam's back with a AWESOME card lol! Great card Sam, Love the colours and your border ROCKS! Love your header pic, wish I was there right now roflol!